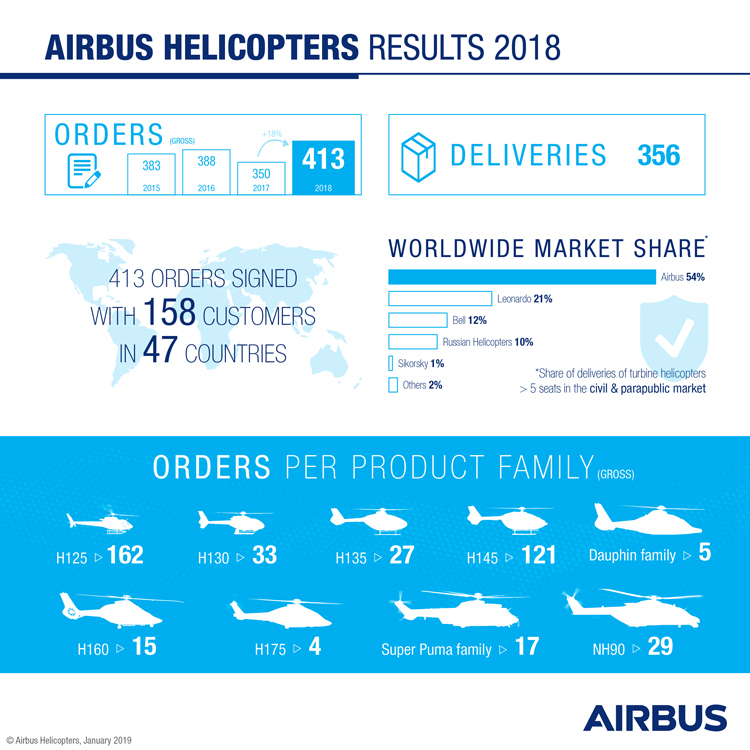 Airbus Helicopters delivered 356 rotorcraft and logged gross orders for 413 helicopters (net: 381) in 2018 (up from 350 gross orders in 2017), maintaining its lead in the civil & parapublic market while reinforcing its position in the military market thanks to key successes with international campaigns. The company also booked 148 orders for light twin-engine helicopters of the H135/H145 family and secured 15 orders for the next-generation H160. At the end of last year, the overall backlog increased to 717 helicopters. "Our commercial performance in 2018 demonstrates the resilience we have developed as a company to help us navigate what remains a challenging environment," said Bruno Even, Airbus Helicopters CEO. "Even though the civil & parapublic market remains at a low level worldwide, we have managed to maintain our global leadership thanks to our wide and modern portfolio of products and services and our international footprint. Meanwhile, we have increased our market share in the military sector by securing major contracts with leading armed forces worldwide, with best-in-class solutions. These positive trends give us the means to prepare the future and continue our transformation, with innovation at our core and customer loyalty at heart." The Full-Year 2018 net orders and backlog represent the contractual view. The Full-Year 2018 backlog value will be measured under IFRS 15 and will reflect the recoverable amount of revenues under these contracts. The FY 2017 backlog will not be restated.